Bringing home a rescue cat is an exciting time for you but can be a little bit scary for your new arrival. Cats are territorial, and coming into a new home leaves them feeling really uneasy. There’s all that unexplored space, and who knows what may lurk there. New smells, sights and people can be a daunting prospect for your new feline friend. Each cat is different and can take varying lengths of time and plenty of patience to settle into home life. Here are some tips to help make the transition from cattery to home as easy as possible both for you and your new cat. Give your cat plenty of time to settle into its new home and make sure that you provide it with a safe place to settle, relax and hide. A comfy bed, raised scratch post or cat box in a quiet corner of the room you want the cat to primarily stay, e.g. kitchen or living room would be ideal. Don’t force interaction with the cat. If they are a little reserved it is important to give them time to relax and approach you in their own time. Allow the cat to investigate its new home. Cats are very inquisitive so every inch of your house is likely to be inspected over the next few days! 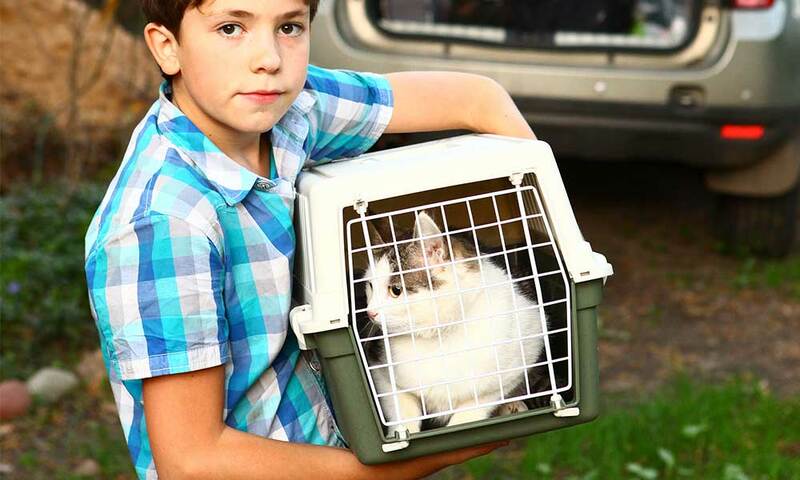 Keep the cat indoors for a MINIMUM OF 3 WEEKS so that they become accustomed to their new home. If you let the cat straight out they might not be able to find their way back to you as it won’t be familiar to them. The first time you let your cat out, time it so that they haven’t been fed. This way the pang of hunger will more likely encourage the cat to retrace its steps back to your home where its main food source is! When the cat returns reward him/her with some of their favourite food or treats. The more times you repeat this process the more likely it is that your cat will stay closer to home and return each day. Don’t be surprised if your cat is off their dinner initially, cats tend to lose their appetite if they are nervous or a bit stressed. Be patient. You can try offering small pieces of food by hand but do not force them to eat if they don’t want to. They will eat once they feel comfortable. It’s not unusual for your cat to be unsettled overnight for a few days. Until they find a comfortable place where they want to make their bed, cats can be very picky about where they will sleep! Use soft gentle tones of voice with them, avoid raised voices in the home, remember everything is new and scary to them. Where is the cat allowed to go in the house and where is it not? Who will feed it and at what times? Make sure everyone is aware not to let the cat go outside for the first 3 weeks. Stick to these rules, routine allows a cat to settle and feel comfortable in the home. Bear in mind that your home routine is going to be very different to what they have been used to at OAS so it may take some time for them to adjust. We advise that you get your new cat registered with your local vet so that they have you signed up on their system ready for when their annual booster is due or if you should need them if a problem arises. It is also a good idea to get your new cat insured. Vet bills can be costly if your cat falls ill at any point. Insurance will cover the cost of lots of different illnesses, but check the fine print to see which they will cover. Keep up to date with Flea and worming treatments. We will have given you the date that your cat’s treatments are next due. Speak with your vet for which brand to use. Prescription treatments are much more effective than shop bought ones. Your cat will come to you microchipped (unless it was too young at the time of adoption) It can also be useful to put a collar on your cat to make it more recognisable. You can get collar tags for cats which you can put your information or your vets information on should you wish. This can be useful if your cat strays at any point, you can be contacted. Although cats groom themselves very well, it can be a nice and relaxing for you to brush your cat, lots of them lap up the attention too! This can also help you to build up a bond. When you have visitors to your house, always give the cat the option to get away if they want to, especially around children. Some cats spook easily and its best to avoid getting the cat to the point where it is going to scratch or bite someone. Cats love to climb so it could be a good idea to buy a tiered scratch post so that they can sit up higher and it also provides something for them to scratch rather than the furniture! The cattery staff will have gone through everything they can with you about the cat before you take it home and will hopefully have given you a good overview of what to expect from them once they have settled in.